Browsing through the shelves of your local library will most likely result in the discovery of at least one Jane Austen novel in the fiction section. However, it is now just as easy to discover an Austen related movie or television show when sifting through Netflix and Amazon Prime Video. This upcoming July will mark the 200th anniversary of Austen’s death, but her novels are still taught within classrooms, read for enjoyment, turned into visual television shows and/or movies, and continuously appear in various new and modern adapted formats. From the YouTube series The Lizzie Bennet Diaries and products on Etsy to vacation packages based in England, Austen and the world in which she portrays is highly accessible and easy to enter into through various arsenals. Whether experiencing the world of Austen for the first time or a full fledge Janeite, these pieces of fiction captivate audiences from a wide variety of backgrounds, age, gender, and cultural upbringing. But how can it be that fictional characters and stories imagined so long ago can continue to intrigue modern audiences from a variety of backgrounds and cultures? Why is it that Austen and her novels still matter in today’s society? To answer these questions, I offer two components that work in conjunction with one another in order to create classic tales that remain relevant for modern audiences. With stories that revolve around timeless elements of family conflict, money problems, and romantic relationships, Austen was able to produce narratives that transcend her personal life and allow for it to fluctuate throughout time. Utilizing examples from Persuasion and Pride and Prejudice, it is evident to see the ways in which the original text written by Austen provides a transformable narrative that makes adaptions and interpretations inspired by the text to be molded into new creations. The first element that contributes to the binary is the classic and timeless nature of the plot, characters, setting, and overall narrative being presented in the text. By basing her novels in the context of daily life, making the plot line believable, and providing main characters with a happy ending, Austen produced literature that readers are able to relate with. Since their dates of publication, readers have fallen in love with the stories Austen weaves together. From Anne Elliot and Captain Wentworth to the Bennett Family, Austen writes in such a way that the audiences emotions mimic those of the characters you are reading about until readers are lost in time and forget that the novels are fictional accounts of life from the early 1800s. Part of the reason for full immersion within the text is due to Austen’s writing style. While Austen writes in a formal way, she composes her work in a straightforward manner that is still able to be read by young adult audiences in addition to older generations. The narratives of both Persuasion and Pride and Prejudice are comprised of three basic plot points that have been prominent parts of life prior to, during, and after Austen’s time for a variety of age groups. These points include money and class based situations, internal family conflict, and the struggle revolving around romantic relationships – or the lack thereof. It is this backbone of realistic elements that make the novels relatable and able to enjoyed throughout a broad spectrum of readers. Whether it is a parent passing the love of Austen onto a child, a teacher assigning a novel as required reading, or readers discovering the books on their own, everyone is able to find an element of the book in which they are able to connect with the story being presented. Not your average “chick lit,” Austen includes elements that would appeal to a male audience by creating strong male characters with prominent roles within society and refraining from explicitly including heavily romantic scenes that are now stereotypical of romantic novels and films. Returning to the three basic plot points of the novel, these elements are not gender specific nor are they relevant to a singular age group. This allows for further inclusion in regards to the variety of readers interested to the material at hand. However, it is also this timeless narrative within the novels that allows for Austen’s work to be adapted by new writers, artists, and creators. The second way in which Austen has been able to remain relevant throughout the past two centuries is due to the wide range of adaptations based upon her original text. As society has evolved and culture shifted, these adaptions and variants have allowed for Austen’s content that was associated with the time period to change in correlation to the modern time. The fluctuations presented in adaptions have the power to keep the attention of previous Austen fans while also attracting new audiences. 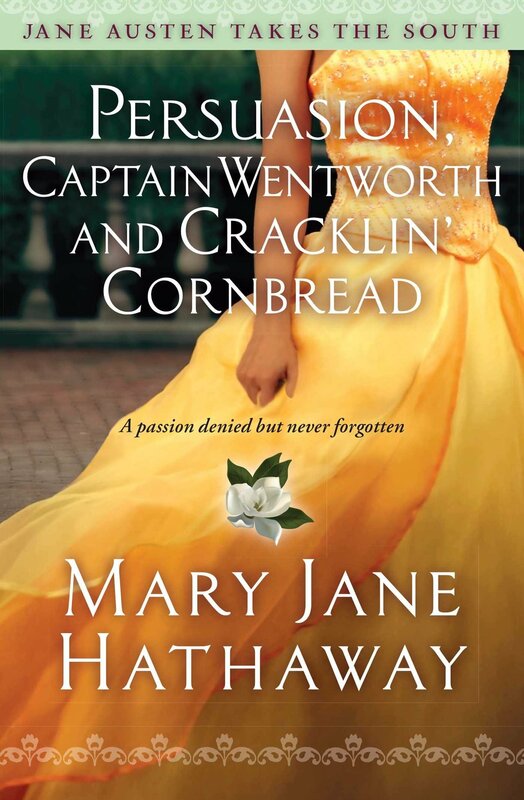 One novel in which this is well executed is Persuasion, Captain Wentworth, and Cracklin’ Cornbread by Mary Jane Hathaway. Using only subtle changes to create her novel, Hathaway was successful in creating a new text that remains true to Austen’s Persuasion while conveying an understanding of social class and expectations of females in the 2010s. The main change made by Hathaway was changing the setting of the novel to the American South during the 2010s. Furthermore, this modern transition included having the main characters, Lucy and Jem, break off their relationship due to attending different colleges and the demanding family expectations for life post-graduation. In addition to having a monetary class difference, which is no longer as heavily influential in accepting marriage proposals, there is also an element of Lucy and Jem being an inter-racial couple. Though Hathaway’s novel is a stand alone piece that can be enjoyed without previously reading Austen’s Persuasion, it continues to feel familiar to Austen fans and allows for them to further explore the lives of characters already well loved. Hathaway, Mary Jane. Persuasion, Captain Wentworth and Cracklin’ Cornbread. New York: Howard Books, 2014. Other books, such as Lost in Austen: Create Your Own Jane Austen Adventure by Emma Campbell Webster or Pride and Prejudice and Zombies by Seth Grahame-Smith, also uses Austen’s novels as a basis to create their own spinoff and new text. While some adaptations are more successful than others, each one continues to add to the overall image of Austen within the realm of literature. With each new novel readers are able to dive further into the stories that have been well loved over the past two centuries. While some adaptations are more successful than others in relying upon image presented by Austen, each one continues to add to the overall context of Austen within literature. Similarly, expanding the potential audience further, movie adaptions that either remain true to the original text or simply use Austen’s plotline as inspirations for a new pieces continue to welcome a variety of people from different genders, age, and culture into the world of Jane Austen. As with book adaptations, visual retellings provide a wide range that include “exact” representations of the original text, modern interpretations that follow a similar, and films loosely based on Austen’s work. In 2007, director Adrian Shergold oversaw the production of a new visual adaptation of Persuasion. Giving both Austen and Simon Burke, screenwriter, credit for the writing of this novel, the film remained true to the overall meaning and structure of the original text including the characteristics of the main characters and setting. Encouraging Austen fans, general book lovers, and chick-flick fanatics alike, the cover/poster for this film clearly stated the origins for the story and utilizes the name Jane Austen while visually showing the leading romantic couple in order to heighten the level of romance being presented. Persuasion. Directed by Adrian Shergold. Clerkenwell Films, 2007. As practiced by many creators of adaptions, Shergold did not try to hide the way in which his movie was related to Austen’s original text but rather promoted this element if order to appeal to a wider audience for his own work. In contrast, the 2006 film The Lake House takes a different approach to Austen’s story. Focusing upon the theme of waiting, two lovers separated by time must find a way to make their soul mate even though they aren’t capable of seeing one another in person. Rather than use the plot line, time period, and characters as Austen created, The Lake House takes their own spin the story. 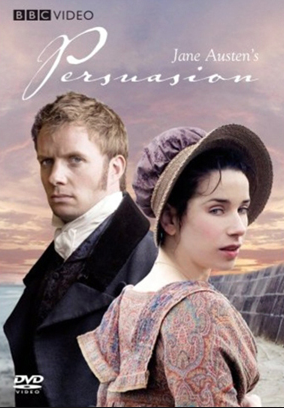 A paperback of Persuasion does play a role in the film, but while viewing the movie it is not directly clear that The Lake House is suppose to be an adaption of the novel. However, this adaption does place a heavy amount of focus on the theme of waiting for the correct timing in life. This was present in Austen’s Persuasion but could have been hidden to some solely seeking the romantic side of the novel. 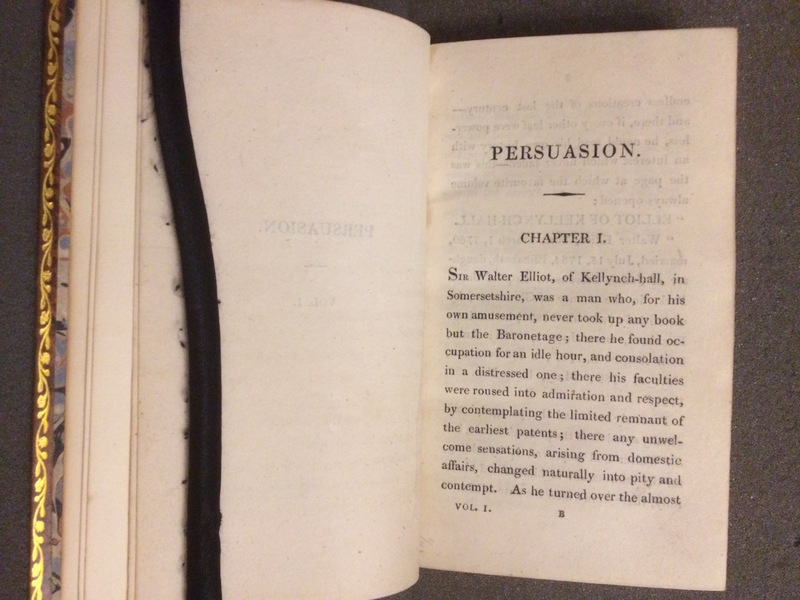 Though not directly recognizable as an adaptation of Persuasion, the use of waiting as in The Lake House allows for those whom have read Austen’s Persuasion to delve further into considering deeper meanings within Austen’s work. This causes the story to emerge as a new creation with only vaguely recognizable characters and plot points that continue to connect it to Austen while also remaining pleasurable to a spectrum of viewers. As with written adaptations, visual representations can be found in a multitude of ways with a broad range of elements highlighting Austen’s work. From Bride and Prejudice that places an Indian spin on Pride and Prejudice to Becoming Jane where Austen’s own life is explored, there are films regarding Austen that are suitable for everyone. With each new film that mentions Austen in the title or relates the plot line to one of her novels, the world of Austen continues to expand through renewed love in addition to new fondness for the stories she wrote so long ago. But why does this widespread exposure matter? It is this exposure to such a large breadth of people that contributes to Austen having the ability to remain part of popular literature today. While Austen created beautiful novels that have been, and continue to be, loved by many, each new adaption expands her stories to a broader audience in addition to causing current Austen fans access to more materials that further grows the world Austen first created. By being able to be revamped, renewed, and repurposed, Austen will never become just another writer of classic literature. Instead, she will continue to beckon readers into her world, accept movie lovers that visualize Colin Firth as their dream Mr. Darcy, and allow for her audience to grow and shift with her as they leave childhood behind and emerge as adults that perceive the story differently but still find solace in-between the lines. So, enter into the world of Austen and see what it is she has in store for you. The door to her world is always open. 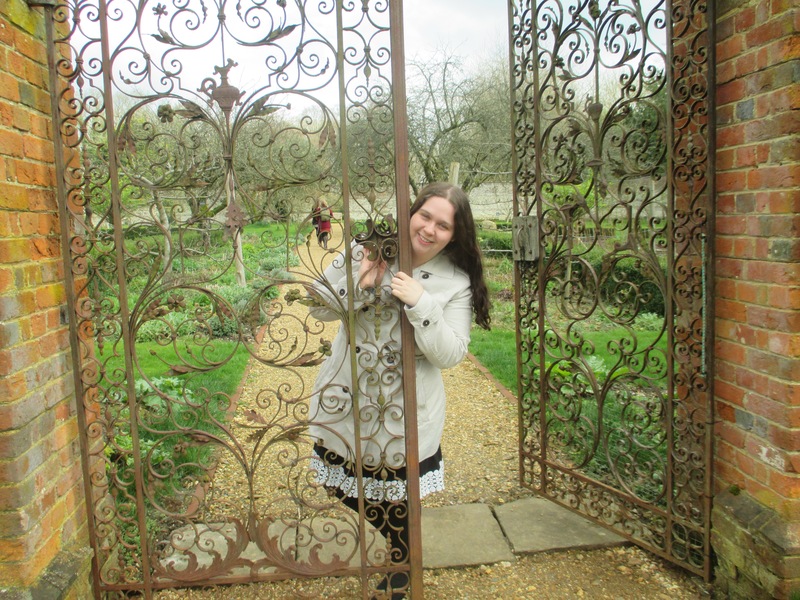 Entering into the gate surrounding a portion of the garden at Chawton House Library. Austen, Jane. Persuasion. Edited by Patricia Meyer Spacks, 2nd ed., Norton Critical Edition, 2013. Print. Hathaway, Mary Jane. Persuasion, Captain Wentworth and Cracklin’ Cornbread. New York: Howard Books, 2014. Print. The Lake House. Directed by Alejandro Agresti. Warner Bros. Pictures, 2006.